A festive design for your Winter wedding, with little bit of retro style. 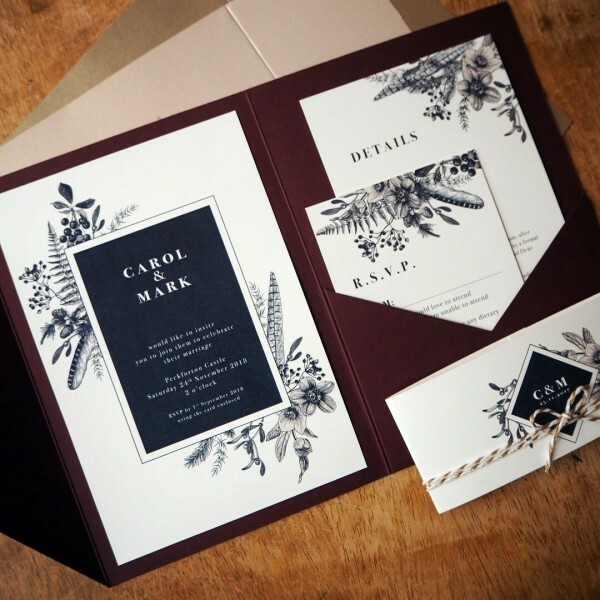 We can match your weddi..
Gorgeous selection of designs to have in an A5 pocketfolder with an invitation, details and RSVP car..
A gorgeous vintage botanical illustration with a delicate, romantic feel for your stationery.This de..
A simple, boho motif combining natural elements and your names or initials together with antlers for.. If a pop of colour is your thing, then this is the design for you! Simple and stylish typography, co..
A rich palette of woodland flowers and foliage sits perfectly with simple and stylish typo..
A wintery palette of woodland flowers and foliage sits perfectly with simple and stylish t..